If you like the idea of turning your living room into an oasis of lush houseplants, but are tired of wasting money on stuff that you just seem to kill anyway, fear not. These days, there are tons of plants that you can buy that are almost impossible to kill, no matter how badly you may neglect them. Below are the top four houseplants to purchase if you're gardening challenged, spanning quite a variety to account for personal preference. Devil's Ivy (also known as Scindapsus or Epipremnum)- As this plant grows, a vine will form that will continue to get longer and longer. The leaves at the end of the vines are larger than those at the base of the plant, making it appear voluminous and lively. Devil's Ivy is pretty versatile, as you can use it as a hanging plant (with the vines and leaves cascading downward) or put it on a windowsill (with the vines and leaves crawling across the whole window area. These plants don't need much light, so it's not a problem if you want to place them in a room without windows, as long as there's some artificial light that will shine on it. Also, if you decide that you want another one of these plants, all you have to do is cut off part of one of the vines and stick it in water. Once you see the roots growing, put it in soil. Jade plant (also known as Crassula argentea)- This potted plant has thick, rubbery leaves and looks almost like a tree. If you keep it around for a while, it will get pretty big (around three feet tall and three feet wide). Unlike Devil's Ivy, this houseplant likes lots of light, so make sure to put it near a window. While the jade plant is fairly low maintenance, if you don't put it in a big enough pot to start out with, as it grows it can become top heavy and tip over or break. Best yet, in many cases little jade plants will start to grow around it (this is because as the leaves fall off, little roots can grow out of it and into the soil). Christmas cactus (also known as Zygocactus or Schlumbergera)- This is one of the best cacti plants to own, hands down. Available in two forms, the Easter cactus (which flowers in the spring) and the Christmas cactus (which flowers in the late autumn or early winder), both versions need a fair bit of watering. Still, this houseplant makes the list because even if you don't water it for a long time, it will survive without flowering. Because they're both in the cactus family, you should keep them near natural light as much as possible. To propagate, all you need to do is cut off a few pieces and stick them in the soil. Eventually, roots will grow and you can'transplant the little cacti into a different pot. 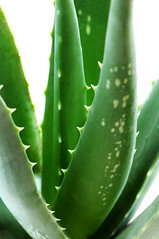 Aloe (also known as, well... aloe)- This is probably one of the coolest plants you can own, because it's so versatile. It has thick, succulent leaves that grow vertically out of a central rooting point and needs lots of light. Depending on how big the pot you have is, the plant can grow to become fairly large. Although some of the leaves have spikes, they're usually fairly soft and not likely to stab you as you walk by. As an added bonus, when you get a sunburn, if you break off one of the leaves and smear the inside on your skin, your pain will be soothed.